Clear plastic tube packaging boxes have a variety of manifestations, including full transparent cylinder packaging and printing of round boxes with lids, in different forms. Full transparency of the cylinder packaging, the biggest advantage is the ability to display products in all aspects, the product of each feature can be visually displayed in front of consumers. Compared with the text or graphic description, the visual display of the product more convincing than other brands of products more market competitiveness. 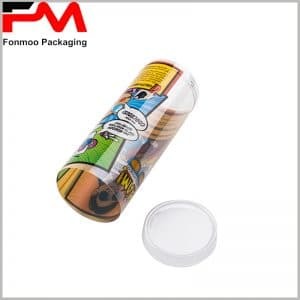 In order to avoid transparent tube packaging is too monotonous, or can not use the influence of the brand to promote product sales, you can spend more thought in the design of the cover lids. Using the paper tube packaging lids, the main design and information are displayed on the packaging cover lids; the top cover printing product and the brand logo highlight the influence of the brand; the low cover prints the specific product information as a supplement to the product. 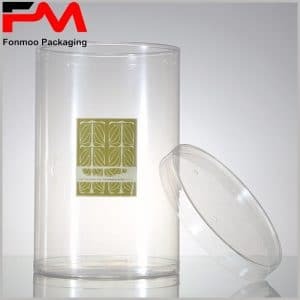 The transparent cylinder packaging shown can be used as a gift box, and the pink packaging lid will target the target customers more towards the female consumer. We are also able to provide you with many styles of custom clear plastic tube packaging, which can be used as food, gifts, electronic products and toys and other product packaging.